A feta sundried tomato burger, now doesn't that sound decadent? It is but it's so easy to put together!! Bring a little Greek influence to your grill and make your neighbors a little crazy jealous with the smells coming off your BBQ!!! These burgers are hefty and definitely won't need a bun. Serve simply with a side salad or slices of beefsteak tomatoes splashed with balsamic vinegar and a good olive oil. Top the burger with tzatziki sauce and prepare for the rave reviews. Your friends and family will ask you to make these over and over again. I used a mixture of pork and beef to make the feta sundried tomato burgers because my grass fed beef is very lean and I wanted a juicy burger. You could make these with just ground beef. Thoroughly mix all of the ingredients together. Shape into 6 burgers, about 8-1/2 oz of meat mixture for each patty. Grill for 15 minutes per side or until internal temperature reaches 160F. Serve with a simple green salad or sliced tomatoes and a dollop of tzatziki sauce or plain sour cream. 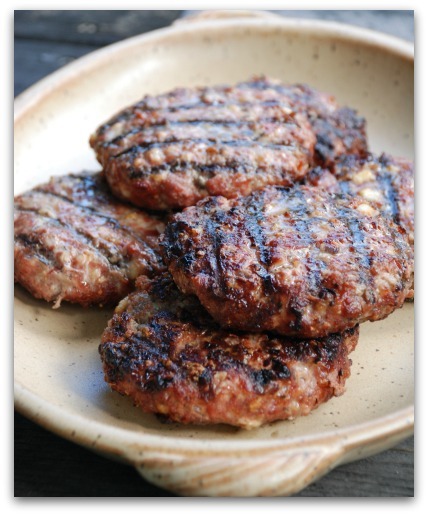 Let's go from this Feta Sundried Tomato Burgers recipe back to the Easy Recipes for Ground Beef page.